The latest Chesterfield magistrates’ court results as published in the September 22 edition of the Derbyshire Times are listed below. Jack Douglas Baldwin, 23, of Nottingham Road, Somercotes, Alfreton. Pleaded guilty to damaging a window valued at £200. Community order to last until September 8, 2017, with a Rehabilitation Activity Requirement. Restraining order to last until March 8, 2017. Fined £60 and must pay £200 compensation. Taylor Cade Johnson, 20, of Dale Road, Matlock Bath. Pleaded guilty to stealing a Green fuel container and cigarette papers and filters valued at £4 belonging to Wilkinson’s. Must pay £4 compensation. Pleaded guilty to stealing an alcoholic beverage valued at £3.60 belonging to Sainsbury’s. Must pay £3.60 compensation. Pleaded guilty to stealing a FILA jumper valued at £15 belonging to the Original Factory Shop. Must pay £15 compensation and a £115 victim surcharge. Pleaded guilty to driving a vehicle otherwise than in accordance with a licence. No separate penalty. Pleaded guilty to using a vehicle without insurance. Fined £120 and disqualified from driving for 12 months. Pleaded guilty to failing to surrender to custody having been released on bail. Pleaded guilty to stealing a six-pack of Heineken beer valued at £5.49. Must pay £5.49. Committed to detention for 16 weeks suspended for 12 months with a Thinking Skills Programme and a Rehabilitation Activity Requirement. James Mark Taylor, 32, of Primrose Close, Ripley. Pleaded guilty to stealing groceries valued. Fined £60 and must pay an £85 victim surcharge and £85 costs. Admits the commission of a further offence whilst subject to a conditional discharge for one year for an offence of theft. No adjudication. Dealt with for the original offence which was subject to the conditional discharge of stealing a belt belonging to the Original Factory Shop. Community order to last until September 8, 2017, with a Rehabilitation Activity Requirement. Ricky Wood, 29, of Pullmans Close, Chesterfield. Pleaded guilty to damaging a window. Must pay a £115 victim surcharge. Admits committing a further offence while subject to a conditional discharge for six months for a public order act offence. No adjudication. Failed to comply with supervision requirements after release from imprisonment by behaving in a manner deemed unacceptable and failed to report to the relevant officer. Dealt with for the original offence which was subject to the conditional discharge of using threatening behaviour. No separate penalty. Committed to prison for ten weeks. Restraining order to last until September 8, 2017. Laura Ann Naylor, 33, of Charlesworth Street, Bolsover. Found guilty of stealing various articles in a handbag including the handbag. Must pay £100 costs. Found guilty of receiving stolen goods namely a handbag. Must pay a £115 victim surcharge and £100 costs. Pleaded guilty to failing to surrender to custody. Committed to prison for 16 weeks suspended for 12 months. Jessica Beth Hodgkinson, 32, of Main Street, Carr Vale, Bolsover. Pleaded guilty to stealing two perfume sets valued at £47 belonging to The Fragrance Shop, Chesterfield. Sentence deferred until December 12, 2016, on the grounds she co-operates with the probation and drug services and does not commit any further offences. Joshua Adam Walker, 20, of Windermere Road, Chesterfield. Pleaded guilty to three counts of assault by beating. Must pay £225 compensation and £115 victim surcharge and £300 costs. Committed to prison for nine weeks suspended for 18 months with a Building Better Relationships Programme and a Rehabilitation Activity Requirement. Restraining order to last until September 8, 2018. Anthony Hopkinson, 26, of Keswick Drive, Chesterfield. Pleaded guilty to using a vehicle without insurance. No toting disqualification imposed due to the prospect of exceptional hardship because it could lead to a loss of livelihood. Fined £350 and must pay a £35 victim surcharge and £85 costs. Driving record endorsed with six points. Also pleaded guilty to being the person in whose name a vehicle was registered under the Vehicle Excise and Registration Act 1994 when it did not meet insurance requirements. Fined £40 and must pay a £20 victim surcharge and £40 costs. Liam Redmond, 29, of Station Road, Hollingwood, Chesterfield. Pleaded guilty to speeding. Fined £246 and must pay a £24 victim surcharge and £85 costs. Driving record endorsed with six points. Callum Reece Haslam, 27, of McMahon Avenue, Inkersall, Chesterfield. Pleaded guilty to driving otherwise than in accordance with a licence. Fined £40. Pleaded guilty to using a vehicle without insurance. Fined £120 and must pay a £20 victim surcharge and £85 costs. Disqualified from driving for 12 months. Pleaded guilty to using a vehicle without a test certificate. No separate penalty. Matthew James Robinson, 22, of Harehill Road, Grangewood, Chesterfield. Admits failing to comply with a community requirement of a suspended sentence order by failing to perform work as directed. No adjudication. Dealt with for the original offence which was subject to a suspended sentence order of exceeding the alcohol drink-drive limit. Pleaded guilty to driving while disqualified from holding a licence. Pleaded guilty to exceeding the alcohol drink-drive limit. Must pay a £115 victim surcharge. Pleaded guilty to using a vehicle without insurance. No separate penalty. Commission of a further offence during the operational period of a suspended sentence for an offence of driving while disqualified. No adjudication. Dealt with for the original offence which was subject to a suspended sentence order of driving a vehicle while disqualified from driving. Committed to prison for 32 weeks. Disqualified from driving for seven years. Karl Alan Wakefield, 30, of Bridgewater Street, New Tupton, Chesterfield. Pleaded guilty to using a vehicle without insurance. Fined £120 and must pay a £20 victim surcharge and £85 costs. Pleaded guilty to using a vehicle without a test certificate. No separate penalty. Rebecca Elizabeth Bown, 22, of Fern Close, Shirebrook. Pleaded guilty to driving otherwise than in accordance with a licence. No separate penalty. Pleaded guilty to using a vehicle without insurance. Fined £150 and must pay a £20 victim surcharge and £85 costs. Disqualified from driving for six months. Daniel Glynn Hainsworth, 30, of Wharf Road, Pinxton. Pleaded guilty to driving without due care and attention. No separate penalty. Pleaded guilty to using a vehicle without insurance. No separate penalty. Pleaded guilty to being the driver of a vehicle owing to the presence of which an accident occurred whereby damage was caused to another vehicle and failed to stop. Community order to last until September 11, 2017, with 100 hours of unpaid work. Must pay a £60 victim surcharge and £85 costs. Disqualified from driving for six months. Robert Saunderson, 36, of Edward Street, Eckington. Pleaded guilty to driving without due care and attention. Fined £220 and must pay a £22 victim surcharge and £85 costs. Disqualified from driving for six months. Pleaded guilty to driving while using a hand-held mobile phone. No separate penalty. 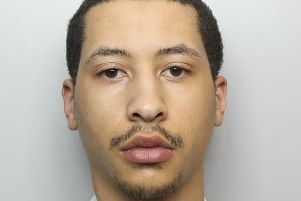 Filip Gabriel Zalewski, 25, of Chester Street, Chesterfield. Proved in absence that he used a vehicle without insurance. Fined £275 and must pay a £28 victim surcharge and £85 costs. Disqualified from driving for nine months. Proved in absence that he used a vehicle without a test certificate. No separate penalty. Adrian Neil Wood, 49, of Boughton Lane, Clowne. Pleaded guilty to failing to comply with a red traffic light signal. Fined £40 and must pay a £20 victim surcharge and £85 costs. Driving record endorsed with three points.